Learners Amy-Lee Visagie, Chrislin Dekoker, Education MEC Martha Bartlett, teacher Christo Fieland and the NCTA's Peter McKuchane. It has been mission accomplished at the annual International Travel and Tourism Student & Teacher Conference and lessons have been learned about tourism’s evolution. Tourism learners and teachers from 15 countries descended on the European elite tourist French city of Nice where research presentations were exchanged. 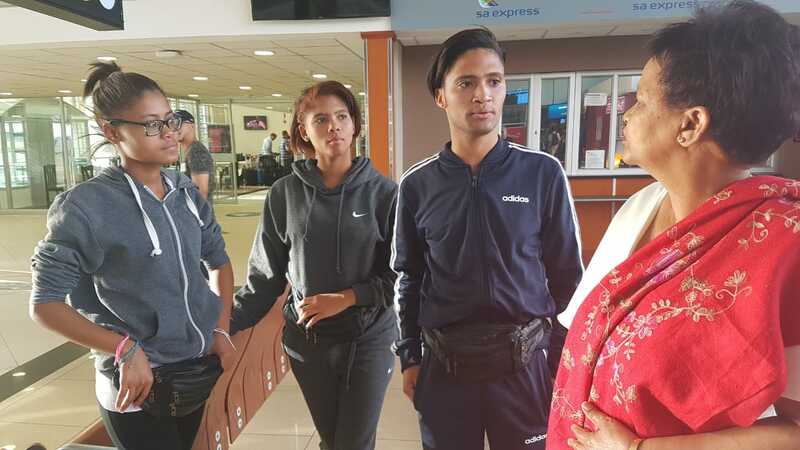 South Africa’s representatives at this global stage were learners Amy-Lee Visagie and Chrislin Dekoker who were accompanied by their teacher Christo Fieland from the Northern Cape’s Carnarvon High School. With the theme being based on Innovation in Tourism, the trio got to present this country’s case study on community benefits from tourism offshoots of Carnarvon’s Square Kilometre Array (SKA) and Sutherland’s Southern African Large Telescope (SALT) which are astrology research based. “It was my first time flying, a bit nerve wrecking when the plane first took off from Kimberley, it was like oh I am going into the air and I wanted to cry but it was an amazing experience and at conference we learned a great deal and met many people,” enthused Visagie who wants to reach for the stars as a travel writer. The French city’s allure and that of Monaco were put to the test when this writer’s question on the beauty comparison between it and their hometown backyard was met with prolonged giggles and an unexpected response. But then motherland got a double thumbs up in the food stakes. “I cannot wait to get home, I miss South African food” added Dekoker with Visagie nodding and mumbling in agreement. In having gone easy on the teenagers over the serious business of conference, noting that they had endured a long-haul flight, the tougher question was put to their teacher Fieland. 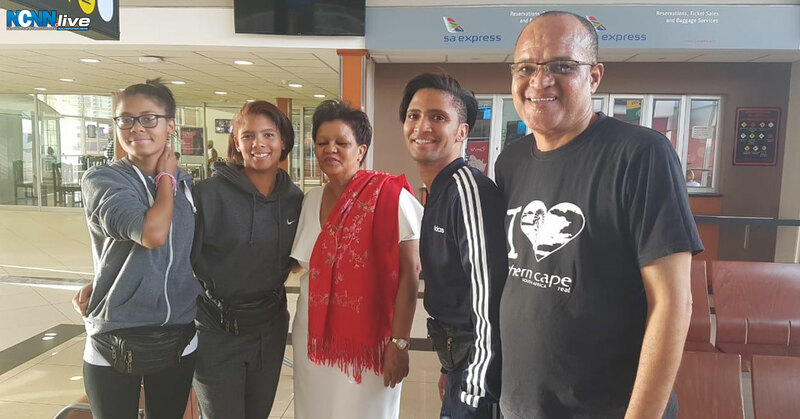 The trio participated in a competition run by the National Global Travel & Tourism Partnership South Africa (GTTPSA), a global body that has unleashed a voyage into creating tourism awareness amongst the youth of its 15 member countries. The trip was sponsored by the NCTA, GTTPSA, Northern Cape Department of Education; Kimberley based businesses – Oleander Guest House, Crystal Enterprises and Printzz & Graystia Suppliers; Carnarvon’s Jacobs Brothers; individuals in the persons of Ms Sharon Hoorn, Ms Karren van Schalkwyk and Ms Lavona van Schalkwyk. 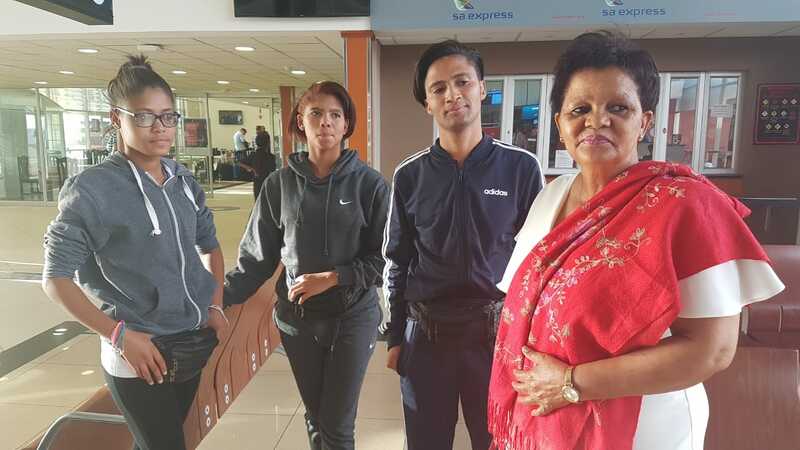 Learners Amy-Lee Visagie, Chrislin Dekoker, Education MEC Martha Bartlett, teacher Christo Fieland and the NCTA’s Peter McKuchane.